I love a good chocolate cake but so far, I have only had a few that I would consider “good”. Now I’m not a food expert so this is just my opinion. 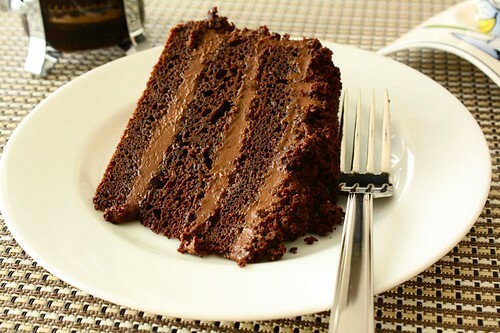 For me, a good chocolate cake must be moist and while it is expected to be sweet, I don’t like to be too sweet. I always like a hint of bitterness just like in a good dark chocolate. So, after seeing them make this cake on America’s Test Kitchen, I knew we had to try it out for ourselves. I must admit that it took us two days to prepare this cake but it’s certainly worth it. I guess if you start in the morning, then it can also be done within a day. We made the pudding ahead of time as it had to cool and set for a minimum of four hours. Once cooled, it is pretty easy to spread just like a regular frosting. It was actually hard not to eat the pudding by itself every time we opened the fridge! Mmm… The chocolate pudding is even good on its own! Here is the part where it gets a little messy. 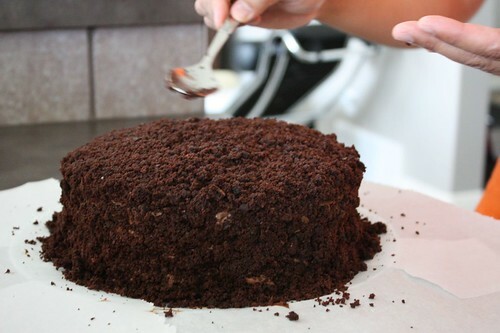 The crumbs have to be sprinkled over the top and sides of the cake after crumbling one of the cake layers. 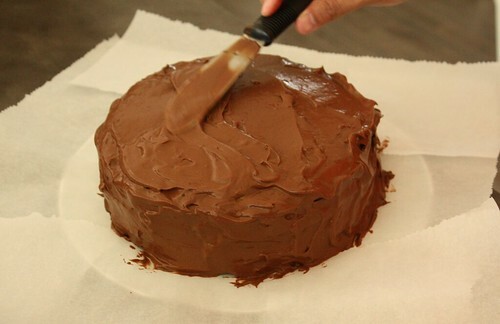 Tip: Place a few pieces of parchment around the edges of the cake for a quick and easy clean-up. And voila! Here is the cross-section of the cake. As you can see, we ate “some” of it already. 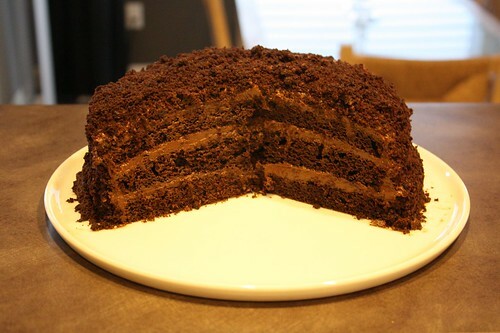 Look at all those yummy layers! Even Mr. Chocolate Bunny agrees. Gotta put the cover on before he finishes it. It is so good I had to have another one! I need a big piece. It’s really that good! It taste even better with a cup of espresso, or two! If you’re a chocolate lover like I am, this is definitely one of the best chocolate cakes to make. One thing to note though, I cannot emphasize enough that Dutch-processed cocoa powder MUST be used as indicated in the recipe. While the recipe says it serves 10 to 12 people, I’m not so sure about that. I believe ours made it to only 8 servings? Well, it would certainly impress your guests, that is, assuming you’re inviting people over. I have attached the recipe below for anyone who is interested. Go ahead. Give it a try! You know you want it. Note: Be sure to give the pudding and the cake enough time to cool or you’ll end up with runny pudding and gummy cake. For the pudding: Whisk sugar, cornstarch, salt, half-and-half, and milk in large saucepan. Set pan over medium heat. Add chocolate and whisk constantly until chocolate melts and mixture begins to bubble, 2 to 4 minutes. Stir in vanilla and transfer pudding to large bowl. Place plastic wrap directly on surface of pudding and refrigerate until cold, at least 4 hours or up to 1 day. For the cake layers: Adjust oven rack to middle position and heat oven to 325 degrees. Butter and flour two 8-inch cake pans. Whisk flour, baking powder, baking soda, and salt in bowl. Melt butter in large saucepan over medium heat. Stir in cocoa and cook until fragrant, about 1 minute. Off heat, whisk in coffee, buttermilk, and sugars until dissolved. Whisk in eggs and vanilla, then slowly whisk in flour mixture. Divide batter evenly between prepared pans and bake until toothpick inserted in center comes out clean, 30 to 35 minutes. Cool layers in pans 15 minutes, then invert onto wire rack. Cool to room temperature, at least 1 hour. 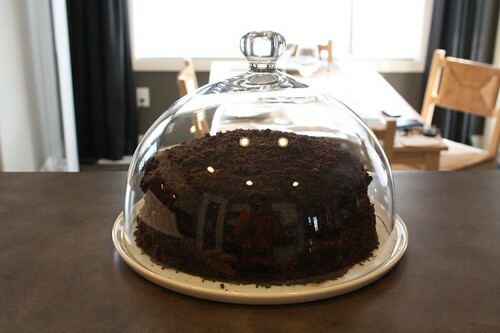 This entry was posted in Food & Drink and tagged cake, cake dome, cake platter, chocolate, coffee, coffee press, espresso. Bookmark the permalink. Post a comment or leave a trackback: Trackback URL. Thanks Stacey. Now that we know it’s good, next time we make it, I’ll make sure to “reserve” a slice for ya! I keep coming back to admire your cake. I wish we lived close enough so that I could just come over for a piece instead of having to make the cake myself (because we both know that will never happen). Thanks Deb! I am thinking of making this cake again as it’s so good. I actually used one of the pictures as a desktop wallpaper at work so I have something to look at when I have a ton of work to do. It reminds me that it’s just a piece of cake! God, I almost had a blackout just looking at the photos. LOL! I almost made it again this weekend but I was afraid I might eat the whole thing. My colleague told me that I could gain a few more pounds just by looking at the picture (since I have it as my wallpaper). You have this as your wallpaper? Are you nuts? I would be drooling so much that I would short circuit the keyboard on my computer!! Well, I had it for a while then changed it. It’s purpose was to remind me that whatever I’m working was only a piece of cake. Unfortunately, it wasn’t doing its purpose!